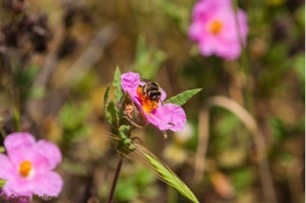 The honeybee, a single managed species, often occupies the headlines and most of the campaigns to raise awareness about the importance of bee conservation. 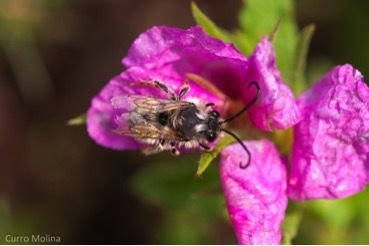 However, there are more than 20,000 wild bee species globally (Yes, double that of bird species! ), and honeybees may just be the wrong species to protect. It is true that without a doubt the loss of many honeybee colonies due to illness or pesticide exposure is an important issue, but it is also true that the number of honeybee colonies is increasing worldwide due to different socio-economic drivers. And these artificially high densities of honeybees might not only fail to contribute to the conservation of the vast majority of bee species, but could also prove detrimental for many of them. 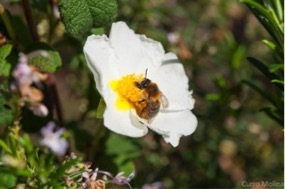 Wild bee of genus Andrena visiting Cistus salvifolius individual. Photo credit: Curro Molina. Basic ecological theory predicts that a dominant managed species can lead to an increased competition for resources amongst its wild relatives, finally outcompeting them. Likewise, high densities of consumers can also harm lower trophic levels by over-exploiting the resources. This is clear in areas where there is overgrazing by cattle for example. But experimentally testing such competitive effects between honeybees and other wild bee species and further testing for potential negative effects on the plants they visit implies modifying whole communities, a rather complicated task. Luckily for us, this experiment was already being done for us in agricultural landscapes in the south of Spain. Dasypoda argentata visiting a Cistus crispus flower. Photo credit: Curro Molina. The data for the paper "Honeybee spillover reshuffles pollinator diets and affects plant reproductive success" is part of a larger dataset sampled for the European project STEP (Status and Trends of European Pollinators). Amongst other ideas, the project tackled the hypothesis that the presence of mass-flowering crops within a particular landscape might be having an effect for wild pollinator communities at the European level (see Magrach et al 2017 Ecography http://onlinelibrary.wiley.com...). 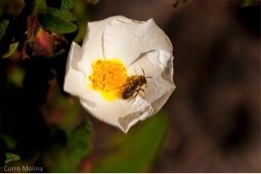 A bee in the Dasypoda genus visiting a Cistus salvifolius flower. Photo credit: Curro Molina. However, amongst the countries surveyed, we found that the sampling within southern Spain revealed a dramatically different pattern: honeybees were the dominant species representing 73% of interactions as a result of the spillover of honeybee individuals from hives located in the vicinity of orange groves in the area. This created the perfect experiment with replicated controls with low honeybee densities and a naturally occurring treatment where honeybee abundances increase two-fold at mid season (see González-Varo et al 2017 Biological Conservation http://www.sciencedirect.com/s...). With this dataset we could finally uniquely test the cascading effects of honeybee spillover on pollinator communities, plant-pollinator interactions and ultimately plant reproductive success. Wild bee (Eucera sp) visiting Cistus crispus flower. Photo credit: Curro Molina. Our findings show indirect evidence that the spillover of honeybees from orange groves to woodland fragments after orange blooming is affecting wild bee species, adding to the plethora of threats faced by this taxonomic group such as climate change, habitat loss or pesticide (ab)use. 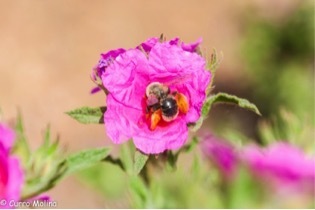 We found all the symptoms of an increased competition between honeybees and wild bee species, with wild bees using a narrower array of floral resources and a distinct one, avoiding plants preferred by honeybees when they were present in large numbers. Moreover, while a small number of honeybee visits may beneficiate common plant species, we show that at high honeybee densities plant reproduction is impaired. Our research thus shows that it is not only the direct effects of agriculture within a landscape (i.e. habitat destruction) that might affect surrounding wild species communities but also associated practices such as keeping bee hives in large numbers. Dasypoda hirtipes found in a Cistus crispus flower. Photo credit: Curro Molina. The adverse effects of excess honeybee abundance is a particularly pressing issue in Spain, home of ~1,000 species of bees and an important hotspot of diversity for this taxonomic group. Yet despite the great richness of bee species in the area many of them have been inadequately described and information on the conservation status for many of them is still lacking. Our research is just the tip of the iceberg and more research should be conducted on the effects of the expanding use of honeybees on other bee species. We hope that our findings contribute to achieving a more balanced regulation of honeybee densities in the future, identifying safe numbers that will contribute to crop production but that will not be harmful for wild bee and plant species. After all, apiculture should not be mistaken with bee conservation. Ainhoa Magrach & Ignasi Bartomeus.